Eating disorders include a range of unhealthy behaviors including excessive caloric restriction, purging, laxative abuse, diuretic abuse, and over exercise. The Diagnostic and Statistical Manual of Mental Disorders (DSM V) includes eating disorders such as anorexia nervosa (AN), bulimia nervosa (BN), binge eating disorder, and other specified feeding or eating disorder (previously termed eating disorders not otherwise specified EDNOS). An estimated 70 million worldwide suffer from eating disorders. As our knowledge of disordered eating increases, so does the awareness of the morbidity and mortality related to all types of eating disorders, not just anorexia. A 19-year-old female athlete with a nonspecified eating disorder was referred for evaluation of bradycardia and clearance for exercise from a local eating disorders treatment center. She denied restricting food intake, admitted to rare purging, and participated in daily practice as needed for her sport. The patient's heart rate was 43 bpm with blood pressure 99/60 mmHg supine. She was not orthostatic. The patient had normal body mass index (BMI) and denied any symptoms. Physical examination was otherwise unremarkable. The patient and her mother insisted the heart rate and blood pressure were normal for the patient; the result of being a well-conditioned athlete. Records were obtained from her pediatrician's office. Documentation from a pediatric well visit 3 years earlier (when the patient was an athlete but denied having an eating disorder) showed a heart rate of 72 bpm and blood pressure of 121/70 mmHg. Examination of records earlier in the current year revealed a loss of 37 lbs over 7 months. Her bradycardia and blood pressure were attributed to the eating disorder, not athletic conditioning. Clinically, the patient did not appear unstable. She had no electrolyte abnormalities. She had no acute electrocardiogram (ECG) changes, evidence of QT prolongation or arrhythmias. An echocardiogram showed normal left ventricular (LV) dimensions and function without valvular abnormalities or pericardial effusion. Immediate hospitalization was not felt to be warranted. She was not given clearance to exercise and returned to the eating disorders treatment center. After 4 weeks of inpatient treatment and mild weight gain, her heart rate and blood pressure improved to 62 bpm and 107/69 mmHg. After 10 weeks of inpatient treatment at the facility, she transitioned to an outpatient program. The patient follows regularly with her internist, therapist, and nutritionist. She has not returned to athletics yet. The case above is one of the patients we evaluated from 2012 to 2014. In total, 45 female patients were evaluated after referral from a local eating disorders treatment center where they were given a diagnosis of AN, BN or EDNOS (at the time of this study patient were assessed by DSM-IV criteria). The most common reasons for referral were bradycardia or chest pain. The patients ranged from 18 to 70 years of age. All patients had a comprehensive history, physical exam, and ECG on the initial cardiovascular visit. If clinically necessary, repeat ECGs and/or transthoracic echocardiograms were performed. If multiple ECGs were performed, the one with the greatest QT corrected interval was recorded for this study. We retrospectively reviewed the history, physical, cardiovascular testing, and laboratory findings of these patients after the project was approved by the Institutional Review Board. Electrocardiography was done using Midmark machines. Two-dimensional echocardiography was performed using a Philips IE33 ultrasound machine. LV measurements were done according to institutional protocol, in accordance with current American Society of Echocardiography guidelines. Statistical analyses were performed using SPSS version 17 (SPSS Inc. Released 2008. SPSS Statistics for Windows, Version 17.0. Chicago: SPSS Inc.). Student t-test and ANOVA test were carried out for continuous variables and Chi-square for categorical variables [Table 1]. Nearly half of the patients (22 patients or 49%) were categorized as having AN, followed by EDNOS (12 patients or 27%) and BN (11 patients or 24%), respectively. BN patients had significantly higher BMI and body surface area compared to AN and EDNOS patients. There was a trend toward higher mean systolic blood pressure in BN patients. There are no significant differences in the baseline QT corrected interval measurements, pulmonary artery systolic pressures, heart rate, LV ejection fraction, and diastolic parameters among the three groups. 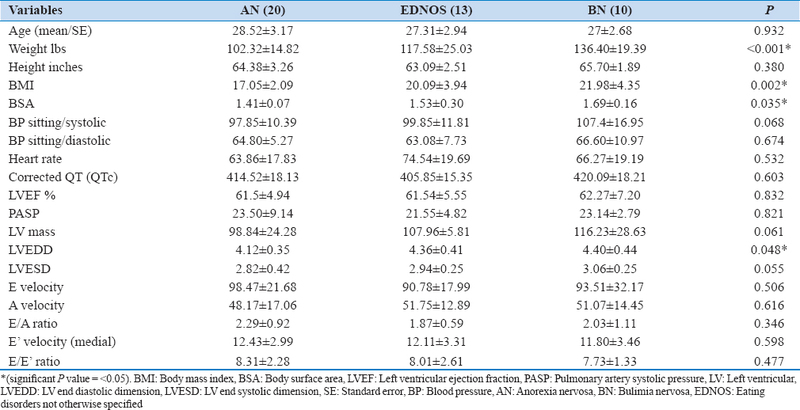 The LV end diastolic dimension is higher in BN and EDNOS group as compared to AN (P = 0.048). Although there are no major differences in certain parameters, the data highlights that hemodynamic changes such as bradycardia and hypotension occur in all groups of disordered eating, not just anorexia. In our experience, 36% of all patients (16/45) were bradycardic (heart rate < 60 bpm). Of the sixteen cases of bradycardia, eight had the diagnosis of AN, five had the diagnosis of BN, and three had the diagnosis of EDNOS. Bradycardia and hemodynamic changes can be seen in eating disorders other than AN, but the morbidity associated with other types of disordered eating are often underestimated. This may in part be due to our limited understanding of eating disorders, which is now improving because of increased research in the field. It may also be due to difficulty categorizing eating disorders. Patients are often not forthcoming about their behaviors, and those behaviors may vary tremendously over the course of a patient's illness. Bradycardia and mild hypotension may be early signs of an eating disorder which can become life-threatening if not recognized. Although our case focuses on a patient with disordered eating and bradycardia, numerous cardiovascular abnormalities have been described in this population. Broadly categorized, they include hemodynamic changes, structural changes, cardiomyopathy, and premature death. Despite profound dehydration and caloric restriction, bradycardia is the most common rhythm abnormality seen in children and adults with anorexia., It is frequently accompanied by orthostatic pulse changes. Bradycardia represents a physiologic adaptation to starvation although other factors such as thyroid disease/T3 reduction and increased parasympathetic activity may also play a role., Bradycardia generally improves as eating behavior normalizes. It may be the initial marker of an eating disorder and is often unrecognized in young patients, especially athletes. Although no conclusions can be drawn from our sample size, resting tachycardia was noted in four patients (one patient with diagnosis BN/three patients with diagnosis EDNOS). Two of these patients had profound increases in heart rate with positional changes despite aggressive hydration. Incidentally both had long histories of significant purging, often with laxative and diuretic abuse. Changes in LV mass and geometry have been noted in patients with AN. Using echocardiography, a reduction of 30–50% in LV mass was found in young women with anorexia and this reduction in myocardial mass was disproportionate to decrease in overall body weight. LV remodeling occurred with decreases in LV volumes, systolic, and diastolic dimensions, but no significant changes in shape. Mitral valve abnormalities described as billowing or prolapse have also been documented by echocardiography. Although the relationship between mitral valve prolapse and anorexia is not well-understood, a decrease in myocardial mass and volume depletion without similar changes in the subvalvular apparatus may produce a relative valvular redundancy or valvuloventricular disproportion resulting in mitral valve prolapse. This would be expected to reverse with weight restoration. Decrease in LV mass is also a potential explanation for the incidence of pericardial effusions, documented mostly in anorexia. Malnutrition without changes in LV mass may also cause pericardial effusion. Most pericardial effusions have been clinically insignificant and noted in case reports or small case series., Although uncommon, there are cases of anorexia associated pericardial effusions with cardiac tamponade requiring pericardiocentesis. In the largest study to date of clinically silent pericardial effusions associated with anorexia, most resolved within 3 months of refeeding. In our single center experience, the cohort with the lowest LV mass was the anorexia group as would be expected. No cases of mitral valve prolapse were identified. Two patients had pericardial effusions (both had a diagnosis of AN), but they were not felt to be significant clinically or by echocardiographic criteria. There were three findings in patients with AN of bicuspid aortic valve with fusion of the left and right coronary cusps. No aortic root dilatation, other congenital disease, or known family history the bicuspid valve was noted. This is an incidental finding as currently there is no known association between eating disorders and bicuspid aortic valves. Cardiomyopathy has also been reported in patients with anorexia. The mechanism leading to congestive heart failure and cardiomyopathy in these patients is poorly understood. Available reports have cited diminished protein synthesis, malnutrition (including a case of thiamine deficiency and beriberi), direct cardiotoxicity from ipecac,,, takotsubo cardiomyopathy, and refeeding syndrome. Refeeding in the treatment of anorexia likely potentiates starvation induced hypophosphatemia, and may not always reverse with phosphate repletion. Phosphate depletion produces widespread abnormalities at the cellular level. No cases of cardiomyopathy were identified in our experience. By visual estimation and biplane Simpson's method, all patients had normal LV function. Noncardiac events such as suicide and alcoholism are causes of premature death in patients with disordered eating. Hypoglycemic coma is rare in anorexia but has been reported with other complications such as pulmonary edema, cerebral hemorrhage, and liver failure.,, Gastrointestinal disturbances and gastric dysmotility are not uncommon in patients with eating disorders. Gastric dilatation and rupture have been described. Decreased diaphragmatic contractility may cause acute asphyxia. Prolonged electrolyte disturbances, catabolism, and immunocompromised state predispose these patients to acute inflammation with subsequent complications of nosocomial infection and sepsis. "Sudden death" is often invoked as a cause of death in eating disorders. However, what we know about eating disorders is extrapolated from data focusing on anorexia despite significant variability among different eating disorders encompassing pathologic behaviors including severe calorie restriction, purging, binge eating, laxative abuse, diet drug use, diuretic use, and over exercise. Notably, sudden death is often associated with QT prolongation, especially if absolute QT intervals are equal/>600 ms. However, few patients with eating disorders have such long QT intervals, as is the case in our study. Other reported risk factors for sudden death in AN include duration of illness >10 years, chronic hypokalemia, and chronic hypoalbuminemia <3.6 g/100 mL. Linking AN or other eating disorders to QT prolongation is often confounded by factors such as electrolyte abnormalities and treatment with psychotropic medications. As clinicians become more aware of the cardiovascular complications of eating disorders, they are better able to recognize early hemodynamic changes associated with eating disorders, the role of echocardiography for evaluation of structural changes, and the risk of increased mortality from cardiac causes. No research grant or other funding was obtained for the completion of the project. This work is not under active consideration for publication, has not been accepted for publication, nor has it been published, in full or in part. Eating Disorders Statistics – National Association of Anorexia Nervosa and Associated Disorders. Available from: http://www.anad.org/get-information/about-eating-disorders/eating-disorders-statistics/. [Last accessed on 2014 Nov 12]. Neumärker KJ. Mortality and sudden death in anorexia nervosa. Int J Eat Disord 1997;21:205-12. Mont L, Castro J, Herreros B, Paré C, Azqueta M, Magriña J, et al. Reversibility of cardiac abnormalities in adolescents with anorexia nervosa after weight recovery. J Am Acad Child Adolesc Psychiatry 2003;42:808-13. Olivares JL, Vázquez M, Fleta J, Moreno LA, Pérez-González JM, Bueno M. Cardiac findings in adolescents with anorexia nervosa at diagnosis and after weight restoration. Eur J Pediatr 2005;164:383-6. Portilla MG. Bradycardia: An important physical finding in anorexia nervosa. J Ark Med Soc 2011;107:206-8. Shamim T1, Golden NH, Arden M, Filiberto L, Shenker IR. Resolution of vital sign instability: An objective measure of medical stability in anorexia nervosa. J Adolesc Health 2003;32:73-7. Yahalom M, Spitz M, Sandler L, Heno N, Roguin N, Turgeman Y. The significance of bradycardia in anorexia nervosa. Int J Angiol 2013;22:83-94. Tokumura M, Watanabe H, Esaki T. Convalescent resting tachycardia predicts unfavorable outcome of anorexia nervosa. Pediatr Int 2012;54:844-8. Galetta F, Franzoni F, Prattichizzo F, Rolla M, Santoro G, Pentimone F. Heart rate variability and left ventricular diastolic function in anorexia nervosa. J Adolesc Health 2003;32:416-21. Jacoangeli F, Mezzasalma FS, Canto G, Jacoangeli F, Colica C, de Lorenzo A, et al. Baroreflex sensitivity and heart rate variability are enhanced in patients with anorexia nervosa. Int J Cardiol 2013;162:263-4. Algra A, Tijssen JG, Roelandt JR, Pool J, Lubsen J. Heart rate variability from 24-hour electrocardiography and the 2-year risk for sudden death. Circulation 1993;88:180-5. St John Sutton MG, Plappert T, Crosby L, Douglas P, Mullen J, Reichek N. Effects of reduced left ventricular mass on chamber architecture, load, and function: A study of anorexia nervosa. Circulation 1985;72:991-1000. Polli N, Blengino S, Moro M, Zappulli D, Scacchi M, Cavagnini F. Pericardial effusion requiring pericardiocentesis in a girl with anorexia nervosa. Int J Eat Disord 2006;39:609-11. Cho YK, Yang SJ, Ma JS. Pericardial effusion in three cases of anorexia nervosa. Korean J Pediatr 2008;51:209. Kircher JN1, Park MH, Cheezum MK, Hulten EA, Kunz JS, Haigney M, Atwood JE Cardiac tamponade in association with anorexia nervosa: A case report and review of theliterature. Cardiol J 2012;19:635-8. Docx MK, Gewillig M, Simons A, Vandenberghe P, Weyler J, Ramet J, et al. Pericardial effusions in adolescent girls with anorexia nervosa: Clinical course and risk factors. Eat Disord 2010;18:218-25. Ward KE, Happel KI. An eating disorder leading to wet beriberi heart failure in a 30-year-old woman. Am J Emerg Med 2013;31:460.e5-6. Turillazzi E, Bello S, Neri M, Pomara C, Riezzo I, Fineschi V. Congestive heart failure as cause of death in an anorexia nervosa fatal case. Int J Cardiol 2013;165:e28-9. Ono T, Kasaoka S, Fujita M, Yamashita S, Kumagai K, Kaneda K, et al. Complete recovery from severe myocardial dysfunction in a patient with anorexia nervosa. J Cardiol 2009;54:480-4. Volman MN, Ten Kate RW, Tukkie R. Tako Tsubo cardiomyopathy, presenting with cardiogenic shock in a 24-year-old patient with anorexia nervosa. Neth J Med 2011;69:129-31. Herzog DB, Copeland PM. Eating disorders. N Engl J Med 1985;313:295-303. Sakurai-Chin C, Ito N, Taguchi M, Miyakawa M, Takeshita A, Takeuchi Y. Hypoglycemic coma in a patient with anorexia nervosa coincident with acute exacerbation of liver injury induced by oral intake of nutrients. Intern Med 2010;49:1553-6. Yamada Y, Fushimi H, Inoue T, Nishinaka K, Kameyama M. Anorexia nervosa with recurrent hypoglycemic coma and cerebral hemorrhage. Intern Med 1996;35:560-3. Beatriz J, Juregui I. Cardiovascular complications in eating disorders. In: Juregui-Lobera I, editor. Relevant Topics in Eating Disorders. InTech; 2012. Availabl from: http://www.intechopen.com/books/relevant-topics-in-eating-disorders/cardiovascular-complications-in-eating-disorders. [Last accessed on 2013 Jun 06]. Abuzeid W, Glover C. Acute myocardial infarction and anorexia nervosa. Int J Eat Disord 2011;44:473-6. Ohwada R, Hotta M, Kimura H, Takagi S, Matsuda N, Nomura K, et al. Ampulla cardiomyopathy after hypoglycemia in three young female patients with anorexia nervosa. Intern Med 2005;44:228-33. Jáuregui-Garrido B, Jáuregui-Lobera I. Sudden death in eating disorders. Vasc Health Risk Manag 2012;8:91-8. Jackman WM, Friday KJ, Anderson JL, Aliot EM, Clark M, Lazzara R. The long QT syndromes: A critical review, new clinical observations and a unifying hypothesis. Prog Cardiovasc Dis 1988;31:115-72. Ravaldi C, Vannacci A, Ricca V. Cardiac complications of anorexia nervosa. Recenti Prog Med 2003;94:267-70.